CSW19, the new Collins word list, will be out in May. Understandably, there have been many questions surrounding this new word list, as there are whenever a new list is introduced. To help with this process, we asked some questions of WESPA Dictionary Committee Chair, Darryl Francis, Dictionary Committee member David Sutton and WESPA Chairman Elie Dangoor. The scheduled release date for CSW19 is in May 2019. 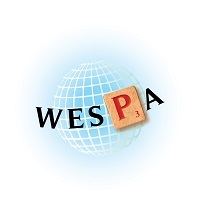 What guide date has WESPA adopted for use in WESPA related events? Elie: 1 July 2019. We allow time for players to get hold of the new list and learn the words. How does this relate to our Member Associations? Elie: Member associations are free to choose their own adoption date, although we would expect them to comply for WESPA rated events, especially international ones. Is there any news on adoption schedules for apps and online games like Facebook Scrabble? Elie: I have written to Mattel to inform them of our adoption date, asking that Facebook Scrabble be changed at the same time. I have yet to hear back. Darryl: The figures below are the very latest, and reflect some last-minute changes and minor corrections. The total number of words in CSW19 will be 279496 (this is taking into account the 29 deletions we are making): 276663 (CSW15 total) + 2862 – 29 = 279496. How long has CSW19 been in the making? Darryl: Low-level preparatory work for CSW19 has been under way since the publication of CSW15. David and I have kept notes about potential additions and deletions, with the intention of reviewing these once CSW19 work took off properly. I had an initial meeting with Collins back in October 2017 at which the new editions and potential publication dates for Collins English Dictionary and CSW were discussed. This was followed by a lengthy conference call with Collins in May 2018 at which detailed plans and dates for intermediate steps were discussed. In mid-2018, David and I became aware that a new edition of the Official Scrabble Players Dictionary (the 6th edition) would be published in August 2018. In July 2018 (ahead of its official publication date), David and I acquired copies of OSPD6 and painstakingly went through every word searching out words which would be new for CSW19. It was good that we did this work in July 2018, because come August 2018, David and I had early sight of words which Collins were going to add to the new edition of their Collins English Dictionary (due December 2018). We checked all these words for Scrabble validity, as well as identifying appropriate inflections. By late November 2018, we had identified all the new words we needed to include in CSW19 from both the new Collins English Dictionary and OSPD6. We were also aware that a new edition of the Official Tournament and Club Word List (OTACWL) was likely to be published following the publication of OSPD6, and this was likely to include further new words. We weren't aware of the publication schedule for OTACWL2018, which explains why we had already put in the work to identify new words in OSPD6. Eventually, in December 2018, NASPA made the new OTACWL words available on its website, allowing David and me to ensure we were able to incorporate these into CSW19. There has been much discussion about some of the additions, like ZE and OK? What are the processes involved for inclusion of any new words? Darryl: While there has been much discussion in the printed media and on social media about the new two-letter words (EW, OK and ZE), it was a simple decision to include them in CSW19. Two of these words (EW and OK) were in OSPD6. Why should David and I choose to cherrypick either or both of these words for exclusion? We wanted to ensure that every word in OSPD6 was to be included in CSW19. Further, we were aware that the online Oxford English Dictionary includes OK in its various forms - uppercase, lowercase, with full-stops, and without full stops. We were comfortable that the OED's treatment of OK was further support for the inclusion of OK in OSPD6. The two-letter ZE appears in the 2018 edition of Collins English Dictionary. There were no reasons to exclude the word, as its inclusion was obviously underpinned by the extensive lexicographical research capabilities of Collins. Apart from the new two-letter words, it was necessary for David and me to determine appropropriate inflected forms of all the new words identified by our dictionary sources. This meant identifying plural forms (sometimes just -S, or -IES, or a foreign language plural form, or other variants, or combinations of these). We also needed to identify appropriate verbal inflections - the addition of -S, -ED and -ING, and whether a final consonant should be doubled or not or both; some verbs are such that they don't take some or all of the -S, -ED and -ING inflections. We also needed to identify appropriate comparative and superlative forms for adjectives - are the -ER, -IER, -EST and -IEST forms valid? Where we have allowed comparatives and superlatives, our decisions are supported by dictionary entries and/or internet searches of authoritative sources. For CSW15, there was an Introduction Kit for players that was prepared. Will there be something similar for CSW19? What would it include? It will follow the same format as preceding kits: lists of new words with definitions, special sections on high-value JQXZ words and vowel-heavy words, changes in hooks to twos, threes, fours and fives, new –S hooks for CSW15 words, new seven- and eight-letter words from the top stems and the top 1000 by probability and, for more advanced players, a comprehensive list of 'impacts' made by the new words on existing words, e.g. new inflections, new variants. The difference from preceding kits is that since this update is a relatively small one, I intend to cover, in the definition sections, all the new words of 2-8 letters. I believe that the CSW19 Kit will therefore go virtually the whole way to satisfying the needs of all but the most demanding of players (the nine and ten-letter word junkies!). What work is being done with study tools/adjudication software? Elie: I am in contact with Collins to update the various tools and licences. Thank you to Darryl, David and Elie for helping provide some clarity as to what to expect come May 2019.